Revamping the pool deck will always involve financial investment. The question is how much would it take and will it be worth every cent. Whether you are aiming for a traditional or contemporary pool deck, there are several features you could invest in that could improve the look and function of your pool deck. While some require second thoughts, these have proven to be worth the investment. The coping is a decorative way of indicating where the deck ends while effectively framing the beautiful pool water. In the past, options were limited to a brick edge or a bullnose coping. These may be popular and traditional but more creative options are now available. It could be made of high-end coping materials or a decorative overlay. For sloped pool areas, creating multiple decks will definitely give the pool area character. This is a lot better than flattening the area out and creating one huge pool deck. With multiple elevations, you can assign each level to a specific purpose. The one closest the pool could hold daybeds, the one next to it could feature a dining area, and so on. This type of deck are held up with retaining walls. Homeowners are getting more and more creative when it comes to design and material choices. 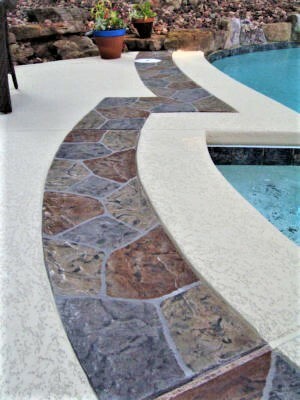 In the past, the pool deck would only commit to one to two types of material. Nowadays, even the most unexpected combinations are made. Tile and brick, natural stone and concrete, and more. The possibilities are endless. This is especially useful when creating sections on a pool deck. The different materials create divisions without actual walls or fences. Sustainable options have never been as popular and necessary as it is today. The most popular eco-friendly options are geothermal or solar heaters, permeable pool deck resurfacing pavers, and more. Solar heaters help conserve energy while making it possible to use the heater more often. Permeable pavers allow rainwater to flow through and be used for other purposes. This keeps water from puddling while making it possible to recycle water. Also called a vanishing or negative edge, this trending design creates the illusion that the water extends way into the horizon. This even looks more impressive when your property is right by the sea. The pool will look like it is connected to the sea itself.